I am incredibly honored and excited to introduce this podcast guest. In fact, this guest is someone who has greatly influenced my work and someone who I admire in both business and philosophy. 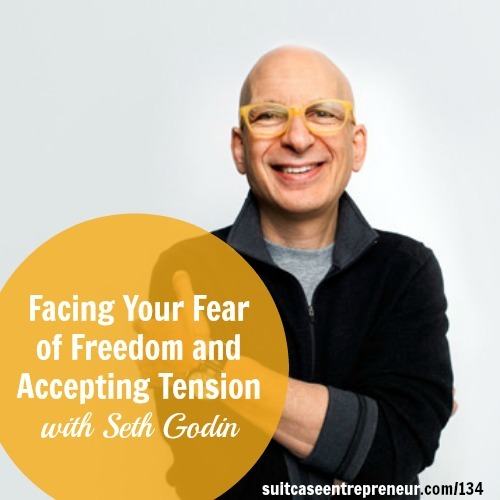 Seth Godin is an incredibly influential blogger, best selling author of 18 books, and fellow lover of freedom. If you have never heard of him then you have surely been living under a rock, but let me enlighten you. Seth is an author, entrepreneur, marketer and public speaker. He believes in respectful marketing and honest work that creates its own buzz because its so remarkable, and holds himself to that same high standard. Having just released his latest book What To Do When It’s Your Turn, he has decided to let buzz be his only marketing tool. When you purchase 1 book, you will get shipped 3, for example. The idea is that if the book is so incredible, you will want to share it with friends or family. And now you can WIN your own copy. Tell us what your idea of freedom is in the comments below, and what you would be willing to do to achieve it, and I’ll choose one person to get a copy of his new book! As you know, I refer to you as my Freedom Fighters – followers who are seeking out their own freedom plan and choosing to live a life based around it. As it turns out, Seth believes you to be more like Freedom Dancers. According to Seth Godin”People are either thirsty, or they are not.” Which are you? Read my favourite Seth Godin book, Linchpin: Are you Indespensable? A weekly email announcing the latest podcasts plus juicy bonus content before anyone else knows about them.